A local work of art illustrates a modern issue close to the hearts of many residents of Pilsen. From streets lined with colorful murals that tell stories and decorate the town, to the smell of freshly baked tortillas, Pilsen is alive and thriving, bursting with local culture. Nestled on the lower West Side of Chicago, Illinois, the neighborhood is only a subway ride away from the heart of the city. And if the Loop is the heart of Chicago, Pilsen could be considered the eclectic soul. Pilsen is an ever-changing town; originally a Czech neighborhood, it is now home to roughly 43,000 people, many of whom are Hispanic. Now practically filled to the brim with traditional Mexican heritage reflected in various forms of traditional food and art, Pilsen has started to change again. Even Ernesto Abina, 42, who has worked in Pilsen for 10 years at Tortilleria Sabinas alongside his father and brother, has noticed the difference. “[Pilsen] is moving to the commercial side, but there are a lot of art galleries opening that showcase local artists from the area,” Abina said. By looking at the vibrant murals that wrap around the buildings of Pilsen, the recent changes in the area are even obvious to visitors. One such work of art, while beautiful, has a powerful modern message. 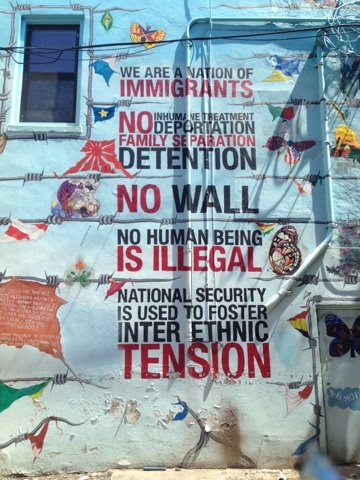 The mural, with its light blue background and torn barbed wire, combines pictures and words to advocate for immigration reform. Some of the few constants in Pilsen are its boundaries: 16th Street to the north, Cermak Road to the south, Halsted Street to the east, and Western Avenue to the west. Daniel Gutierrez, 67, has lived in Pilsen for 57 years. Frequently locals walk up to say hello and wish him well as he sits outside of his restaurant, Nuevo Leon, showing just how tightly knit the community in this area is despite the growing diversity. While in other cases change may seem unnerving, Gutierrez believes it has benefitted this historic neighborhood. What are you doing in Pilsen?